Drill a 1 1/4 inch hole in the counter top. This is where you will be putting the air switch. Make sure that you find a spot that is easy for you to reach. Use the rubber gasket above the counter for the air switch on the outside and tighten with plastic nut from below your sink. If you will be mounting air switch button on a sink top, you may use the hole for sprayer or soap dispenser. Attach one end of air tube to bottom of air switch button and the other end to the white nib on the black converter box. Use your cutter to cut the air tube to desired length. Inspect the quality of plumbing under the sink and make sure there are no leaks. If there are, seal them using putty. Since you will be placing an outlet under your sink, it is important that the area under the sink is kept dry at all times especially when installation is being done. Switch off power to the kitchen area to ensure safety. Do this by going to your home's main power box and turning off power to the kitchen. Once you have turned the off, plug converter box into wall outlet. Plug sink disposal cord into converter box. Turn on main power switch to the kitchen once again. Now you are ready to use your garbage disposal air switch. This switch is very simple to use. Press is to deploy the garbage disposal and press once again to stop it. 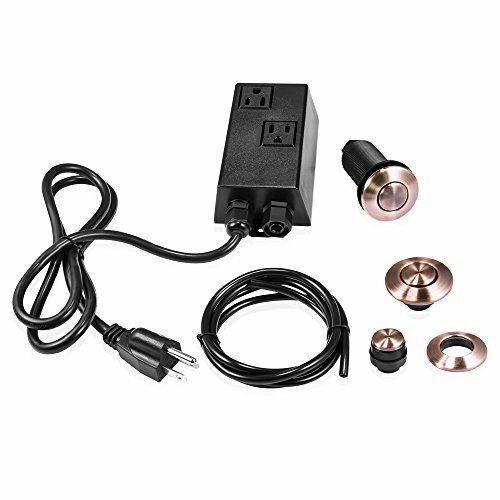 Perfect way to control your garbage disposal ---- A single touch of elegance making your kitchen more convenient with these sink top air switch control kit. Easy installation and works in any garbage disposal ---- Air switch kit can be mounted easily to any sink or counter top installation. 30 days money-back guarantee and 1 year replacement warranty for all products we sold. If you have any questions about this product by Kungfuking, contact us by completing and submitting the form below. If you are looking for a specif part number, please include it with your message.